•- Polifenols – tonifying and protecting effect for the blood vessels, acting upon the free radicals and enzymes which produce skin and blood vessels aging. •- Flavonides – boosts the cellular changes. •- Proantocians – regulating action upon the collagen fibers. 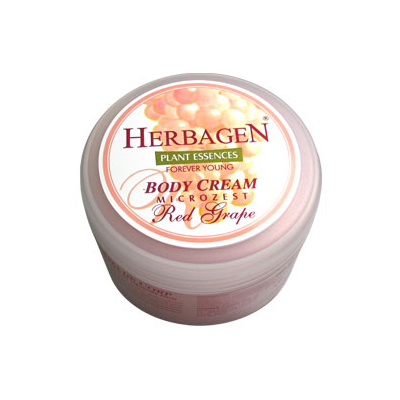 HERBAGEN Body Cream with Microzest Red Grape represents a new concept with trans-epidermis action. On skin contact the powder is carried by the cream and the active substances penetrate the epidermis being quickly absorbed at cellular level.